Traveling with vegetarian parents was concerning. Cairo had a few choices for vegetarian food, with Indian restaurants readily available. But, Aswan and Abu Simbel offered none. We had to make do with scavenging the buffet of our hotels for vegetarian food. But Abu Simbel was a nightmare for our parents who couldn't stand the smell of meat being cooked in a regular African restaurant. So stock up on snacks when traveling south. Luxor had an Indian restaurant but it was mostly always booked for the large tour groups and hence we had to work around their times. So yes, food is a bit of concern especially if you are keen on Indian vegetarian food. Also, if you are stepping out early for the day, most of the hotels provide packed breakfast boxes. 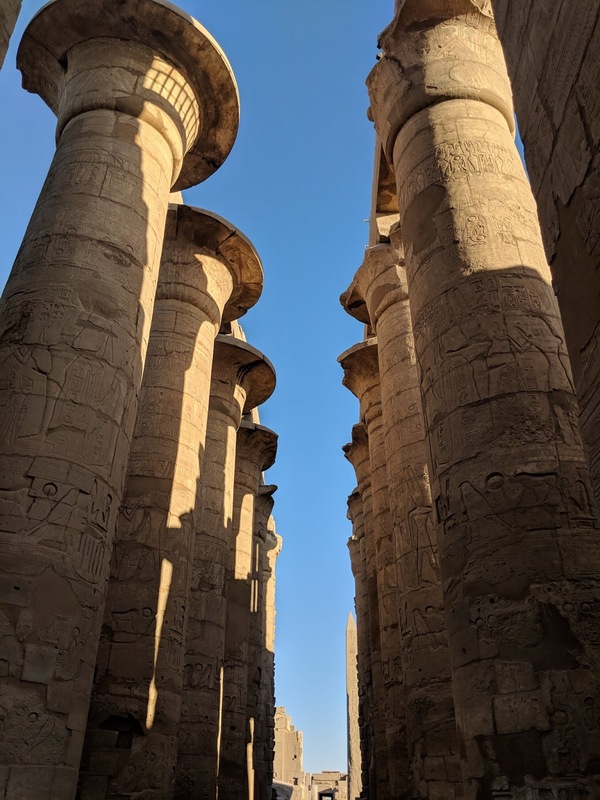 There is a lot to see in Egypt and it offers plenty of history. But its not possible to plan for things without a tour company. You can absolutely plan according to your preferences and comfort, but you can't do the trip as a DIY. Hence, pick the list of things you want to see and do and pick a travel agency that can weave it all into one itinerary. For us the hotels offered were 4 and 5 star rated and they were all excellent. None of the hotels we stayed at were disappointing. At this point, I must mention the our tour planners: Memphis Tours. Very responsive, prompt and had very good transportation and guides for us, given we had 8 adults and 1 child in our entourage. We flew in and out of Egypt from Cairo. 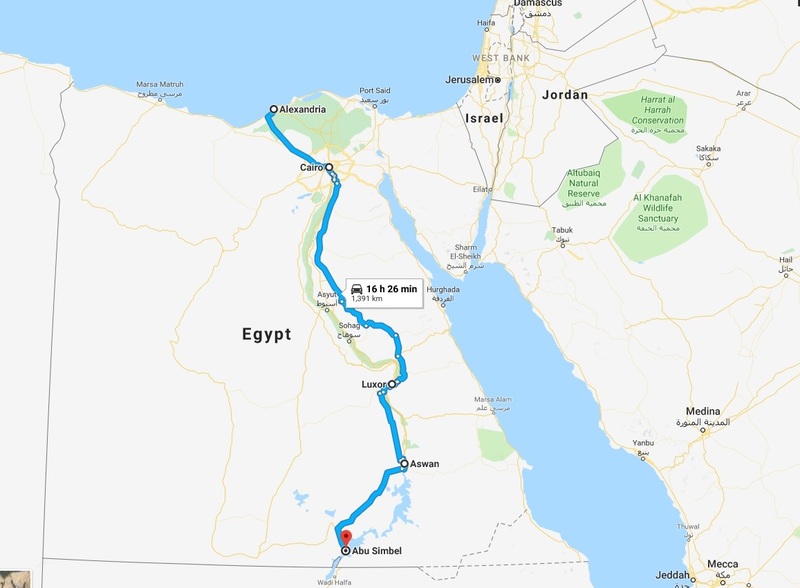 Alexandria is a three hour drive from Cairo. 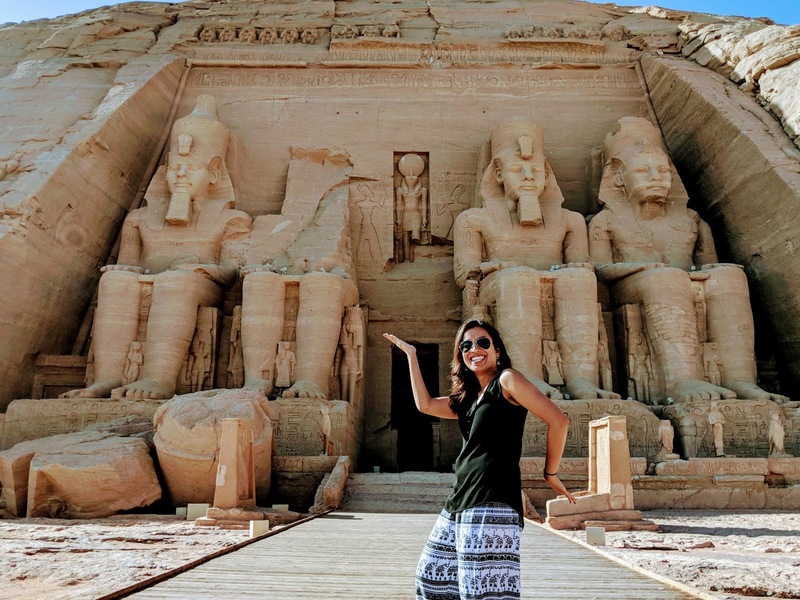 For Abu Simbel, either you fly directly to the airport in Abu Simbel, or you can fly to Aswan and then take a three hour drive to Abu Simbel. Luxor is a three hour drive from Aswan and also has an airport to fly in and out of. Plan as you see fit. Some folks take an overnight cruise along from Aswan to Luxor as well. We chose to fly or take the road between various cities. Its a developing country so there aren't many rest stops along the way, road aren't that great and scenery isn't too exciting as well. So, if the cost doesn't hurt, flying may be the best option. The Pyramids! Yes, the pyramids. Our first stop in the city was The Pyramids. There are three pyramids of different sizes and they are huge! Yes, they live up to your expectations. 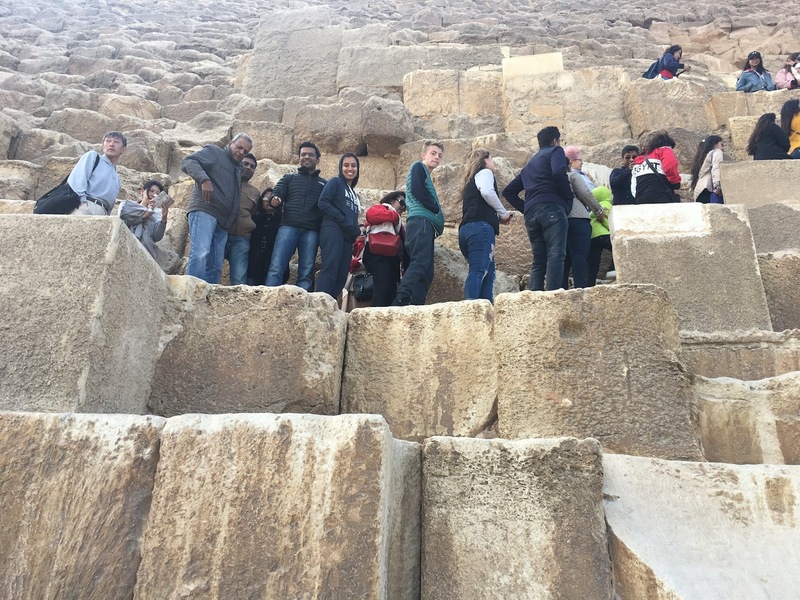 There is a special ticket and you can go inside the biggest pyramid and see the tomb. There is a narrow opening and a narrow passage to get to the tomb and come out. Of course we were doing that! Only that once we got in, and were half way through, the passage was so narrow that I suddenly started feeling claustrophobic, with my legs shivering and I was sweating profusely. Without a second thought, I turned around and came out. It was a strange feeling I had never experienced before but I think I am more considerate of people who say they feel claustrophobic. Its not pleasant. But the rest of the gang completed the trip and came out pretty happy about their accomplishment. For the pyramids, the more important thing is to know where to take the pictures from. The guides know it the best. 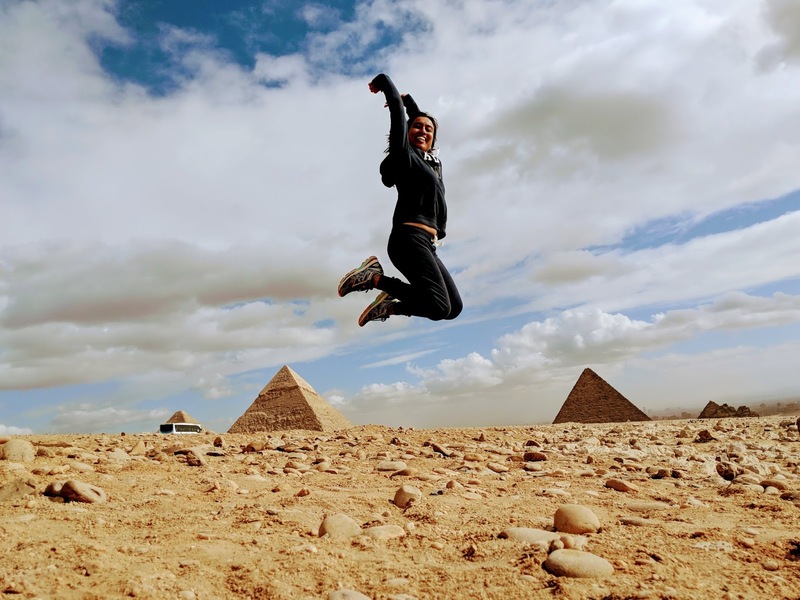 I had clearly stated I wanted pictures jumping over the pyramids and kissing the Sphinx. He made sure that we went to all these spots. There is also a camel ride around the pyramids, but its best to ask your guide to negotiate a price in case you are interested. Have heard enough instances of being cheated upon. So after our awe-inspiring Pyramid and Sphinx darshan, we were headed to the the Egyptian Museum. It was undergoing renovation then, but I hear it is now ready and is well renovated. The guide gave us our own headsets so that he could communicate with us. This museum is loaded with historical significance, but our parents were super tired walking around in this museum. So, not a good idea if you aren't up for setting your fitbit on fire. For me, personally, the highlight was Tutankhamun mask and his chamber. Just pure gold, loads and loads of it. There is a mummies chamber too and there are plenty of them and the bodies are so well preserved that was scary I felt. From the museum, our next stop was the Coptic Church. Cairo has a thriving Christian population also. And there was news of some shooting at a nearby church the previous week. But, funny enough, the guide compared it to the school shootings in the US and told us they were safe as we were still sending kids to school in America. I really had no answer to that. The church wasn't that great architecturally, but had more significance in terms of history and having a church in middle of a Muslim dominated city. 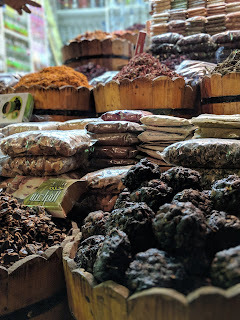 Next and final stop was the Khan El Khalili bazaar. 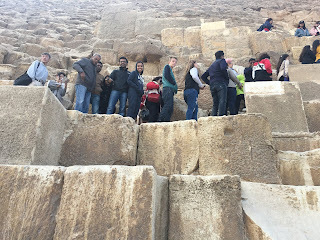 I was looking to get a pendant in the hieroglyphs, but we were short on time, and the suggestions that the guide made were a little too expensive than I had imagined. So, I changed my mind. Family was very interested in buying some Egyptian cotton sheets and all, but this is where we felt being with a guide wasn't useful as they took us to the shops they knew and they were pretty expensive, I imagine they had a commission in the sales. So, we didn't buy those either. This is the rendezvous city for Egypt. Cairo airport is well connected to Africa, Middle East and Europe. The tour agents are allowed to come into the airport before your immigration check and help you out through the immigration as well. Not that there is any help needed, its pretty straightforward like anywhere else. We stayed at two hotels in Cairo, one at our arrival and other for our departure. 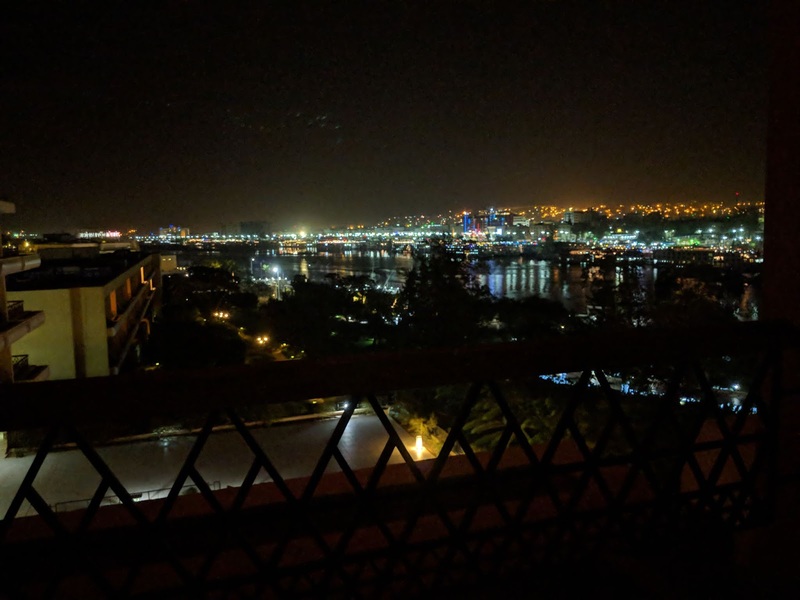 Fairmont Nile Hotel was luxurious hotel and we absolutely loved it. 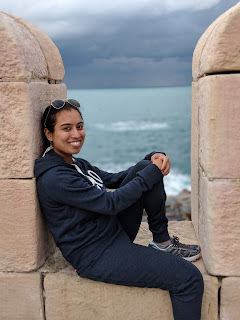 Second, we stayed at Fairmont Hotel Heliopolis as it was close to the airport and made our trip to the airport shorter. 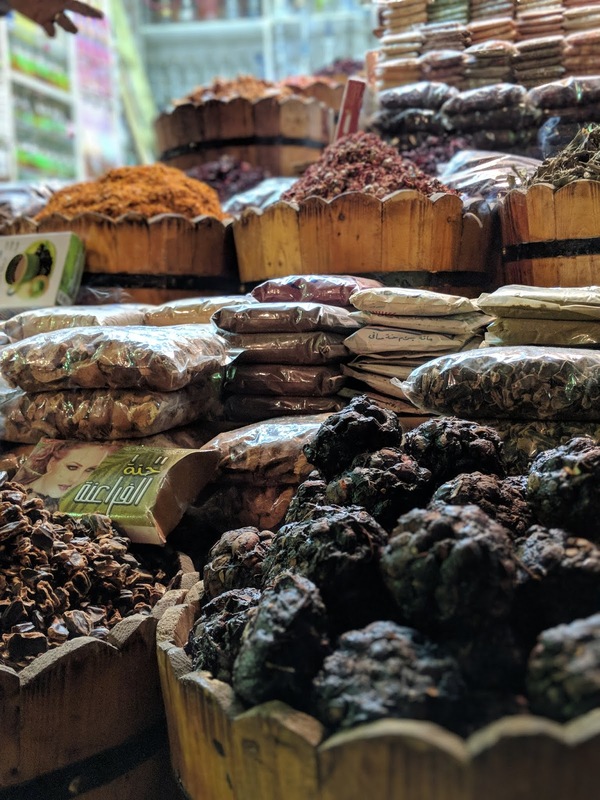 A barely three hour drive from Cairo, it is a crowded old-town on the Mediterranean coast. Navigating through the town in a mini-bus reminded me of crowded streets of Delhi. Densely populated and not much order to the chaos. Our first stop was catacombs. I was quite excited as the first time I went to Catacombs, was in Peru and it left me in awe of the whole concept. Bit the catacombs here are quite underwhelming. First, they are in middle of a housing locality and there is just a tiny staircase leading to the underground catacombs. The facade isn't exciting, on going downstairs, you see the tiny, humid rooms with hieroglyphs and painting on the wall and you are reminded, you are in Egypt. The mecca of historians. Next up, was the Qaitbay Fort. Perfectly located fortress at the Mediterranean shores. It gives you really pleasant views of the city. I loved taking pictures here. Next we went to Alexandria library and it had such a unique architecture. I here the new tech buildings in bay area are based on that architecture. The sunshine comes in through the roof at every floor. I thought this was definitely worth the visit. That completed our Alexandria visit and we were on our way back to Cairo from here. We stopped at some Indian restaurant for dinner. Glad we found something that was tolerable for our parents tastes and we went home fully fed. After pyramids, the next thing on my list was Abu Simbel. Its three hours one way from Aswan, but absolutely worth it. A very old temple, located at the bank of the river and just next to Sudan border. Its not just the history of Ramses II that makes this place highly significant, but how construction of the dam made relocation of Abu Simbel and international project. A marvellous engineering and archaeological feat. 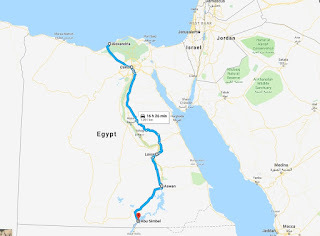 More so, the public access to Abu Simbel just started recently, as earlier due to threats from Sudanese terrorists, you had to be accompanied by security convoy in order to visit. Abu Simbel does not disappoint. Its freaking awesome. The whole architecture, the history, the location, its simply mind blowing. I am so glad we made the trip all the way here. I won't write too much about the history of this place as you need a guide for that, plus I don't remember much of it anyway! The drive from Abu Simbel to Aswan offers vast landscape full of dunes. I was so happy to see those that I requested the driver to stop around sunset so I could take some SRK pose pictures. But, there are no places for food. A couple of local restaurants didn't have vegetarian options and we barely got by with soup and rice. My mother in law refused to even taste it and didn't enter the restaurant because of the smell. So, be mindful to pack up your food bag when making this day trip. By the time we reached Aswan by night, we were dead tired and wanted to catch a break. So, we decided to start a little later the next day. The hotel we stayed in was by the bank of river Nile, Movenpick Aswan resort. Luxurious hotel, with excellent amenities. had to take a short boat ride to get to the hotel as there was no direct road to the hotel. So cool! After a late start to our day, with our bellies full of buffet breakfast, we headed to the unfinished Obelisk. Initially uninterested, I quite liked it. And after that have been paying more attention to other obelisks in the world and where they are located. I didn't know that most them were quarried as a single stone and were stolen from Egypt during multiple wars and raids. It was a bit of a hike to get to this unfinished obelisk, so we left our parents at the market on the streets and made a quick trip with the guide. 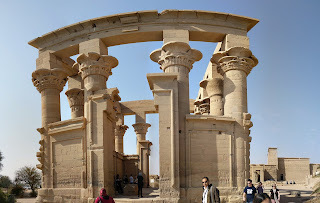 Our final and most enjoyable stop in Aswan was the Temple of Philae on the Isis island. You can get here by boat. You walk through a local market of handicrafts and souvenirs. Good place to shop, but must haggle. Also not that once you engage any seller, they won't let you be. After a quick boat ride, we reached the Isis island. Beautiful, old Egyptian architecture with many many wall paintings and carvings with colors preserved till date. This place was crowded and why not. It was beautiful and that history lesson from our guide made it even more valuable. Excellent place to take pictures too! I loved our hotel in Luxor too. Steigenberger Nile Palace Luxor was where we stayed and Luxor is the most touristy places of Abu Simbel and Aswan. It has more shops and is a bigger township. We were staying here for two nights. Since we reached early, we decided to venture out, which turned out to be quite an experience! We decided to take horse carriage rides from our hotel to the local souvenir market. A well known tourist stop, now I don't remember what the exact name was, but ask your hotel people and they'll know. So, we fixed a price and got on their carriages, Two of them, of course, with 8 adults and a kid. They took us straight to some souvenir hop where they probably had a commission on sales. It was pricey, didn't have much stuff and not where we asked to go to in the first place. Hence, we got really pissed and asked the carriage guy to take us back. Now on our way back, they tell us the price was one-way price for the carriage ride. It was a nightmare to just sit tight as it wasn't your country, not the language you spoke, so just sit quietly and go to the hotel. Once back, we got off and asked the security folks of the hotel to deal with them. Apparently it is a well known scam run by these folks and if in any case you need to go somewhere, either by a carriage ride or by a taxi, ask your hotel staff to help you out. They will get reliable people. Okay so now for the good stuff. Luxor has hot-air balloon rides and Sumit and I skipped it, but we sent our parents for the balloon ride. We decided to sleep in for extra two hours and join them later. If you haven't done it before, you should do it at least once! Our first stop was Valley of Kings, this is the burial spot for Egyptian Kings. There are many tombs that are open and colors on the walls are still bright and painting clear. So, definitely go inside a tomb or two. King Tutankhamen's tombs has his mummy. All the other stuff from his tomb is in the Egyptian museum in Cairo though. It truly is the valley of kings. But it gets hot and dry hair, so take that and always carry a bottle of water. Next up was Temple of Hatsheput, which has this grand facade and makes you think how did they manage to build such architecture back in those days. Behind the facade things aren't restored as well, but it is worth the trip. After this, we went to Colossi of Menmon. Final stop for the day were Luxor and Karnak temples. Overpowering pillars and structures throughout this small sight. Lovely place to take pictures and soak in some Egyptian History. 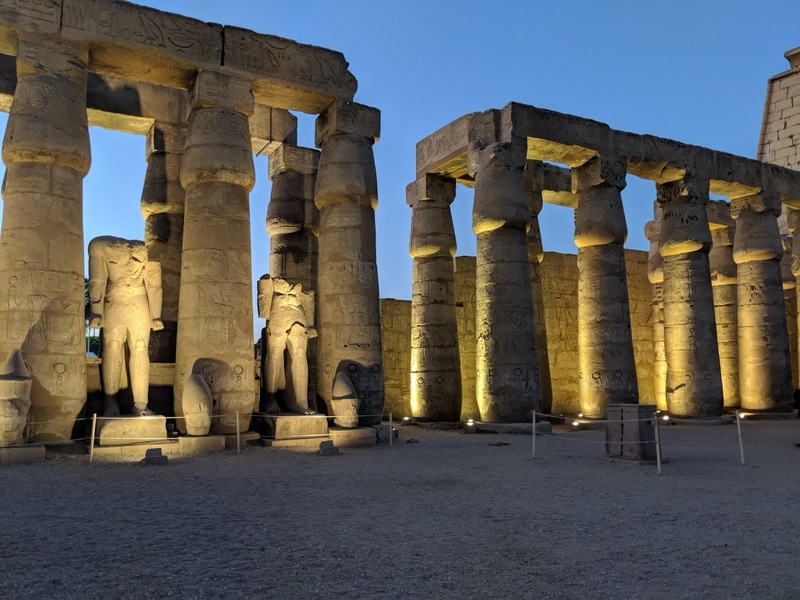 As the sun sets, the lights come out and light the pillars and the architecture in a very elegant manner making these historic masterpieces look even more magnanimous. 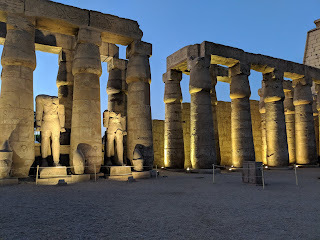 Luxor by far had the most beautiful architecture and history to offer in Egypt. There was also a cute little marketplace to shop. We went here on the second day, after the carriage-ride adventure on the first evening. Best place to shop for some souvenirs. They have these painting on a piece of paper that they roll up and give it to you for you to frame on your own. Best souvenir you can take back, I think. There was also an India restaurant around to cater to the huge Indian tourist groups. The owner was a very sweet guy, who on request made space for u sin his tiny little restaurant during his off-peak hours. Cruise on Nile: This is super popular. Given Abu Simbel, Aswan and Luxor are all located on the banks of Nile, staying on a cruise make sure your travel time is covered overnight. 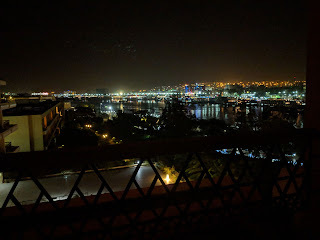 Also, the view from Nile of lighted up cities across the banks must make for a pleasant view. Light and sound show: Both cairo pyramids and Luxor temples have evening light and sound shows. We skipped those, but something you might want to consider.